How can I find out the SSID and encryption key of the AirStation? 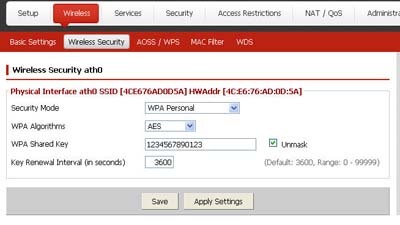 - Details of an answer | Buffalo Inc.
How can I find out the SSID and encryption key of the AirStation? Refer to label on the side of the unit. Refer to web configuration interface. Go to [Wireless] - [Wireless Security] tab. Go to [Wireless Config] - [Basic] tab to see details of security settings. Note: In User-friendly Web Interface under [Wireless Config] - [Basic], the default encryption Key is always masked. Be sure to keep a record, if default key is manually changed by administrator.